Sometimes you start reading a book and you know from the first five pages that it's going to be great. Hemlock was one of those books, and I was certainly not disappointed. Mac lost her best friend Amy to a werewolf attack. Months later, the white werewolf who killed Amy still hasn't been found, and Mac is continually haunted by Amy in her dreams. Then, one day, the werewolf attacks start again, and Trackers - aka werewolf hunters - arrive in Hemlock to search for the killer. However, Mac would rather not have the Trackers in town. They seem to be causing problems, not to mention the fact that Mac's friend Jason is spending more and more time with them. Mac decides to take on the search for Amy's killer herself. But once she starts gathering information, she finds out that she might be in over her head, dealing with secrets she never imagined and situations she might not be able to escape. In a town full of secrets, who can Mac trust? One of the things I love about YA is how books so easily cross genres. Hemlock blends elements of paranormal and mystery stories, bringing a fresh twist to werewolves. In Hemlock, everyone in the US knows about werewolves - or those that suffer from Lupine Syndrome - and they all hope to avoid werewolf attacks that come with the threat of being changed or killed. Beyond those things, there is still so much to love about Hemlock. One of my favorite things about Mac was her dedication to her friends. She was determined to help all of them, even those who weren't her "best" friends. I also really enjoyed the way Mac's dreams with Amy were incorporated; it provided a great glimpse into Mac's psyche and made their relationship that much more real. Then there was Mac's best guy friend, Kyle. Who could help but fall for him? And even though at first it seems like there's a hint of a love triangle, in reality things are much more complicated. 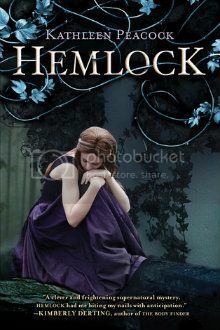 The story of Hemlock is so engrossing that I forgot everything else while reading. I was swept away by the mystery as well as the excellent writing, and even though I was able to figure out some of the secrets, there were still unexpected surprises. The synopsis definitely doesn't lie when it promises "provocative questions about prejudice, trust, lies, and love." Hemlock is a fabulous debut novel that is not to be missed. Everything about this book left me wanting more, and I cannot wait to read the next installment of the trilogy!